milling those clothespin halves is finally done! Making clothespins as a personal woodworking project, to give as beautiful, functional, heirloom-quality gifts, is one good reason to make them. But handcrafted clothespins can be a nifty little home business too. My experience has been that people who use clothespins for hanging clothes, and who are totally frustrated by using cheap, imported clothespins, will pay a premium for dependable traditional-style clothespins. The demand for such clothespins is high. That being the case, I believe there is a lot of opportunity for any woodworker who has the skills and patience to craft clothespins. How much you can make with this unique business idea will vary, depending on how much you pay for the wood, the efficiency of the tools you use, and how organized you are. When it comes to numbers and calculating profits, I’m a back-of-the-napkin kind of guy. Besides that, I’m still refining my manufacturing process. So the figures that follow are all ballpark numbers. In time, I’ll have a better idea of my costs and profits. But, for now, I’m satisfied that I’m making enough to justify the effort I put into the business. In the late summer of 2014 I bought 300 square feet of kiln-dried ash lumber (planed to 3/8” thick). That amount of wood yielded around 20,000 clothespin halves (which would, of course, make 10,000 assembled clothespins). Approximately 2,000 of the halves were rejected for various defects and sold as unfinished factory seconds. I tend to be very fussy when grading the halves. Some of the remainder of the clothespins were sold as Assemble-Them-Yourself kits. I developed the kits because my first batch of clothespins were so rough in places that they wouldn’t tumble-sand very well. I figured the customer could do some touch-up sanding and save some money. But I no longer have that problem ( because I use better quality saw blades) and no longer sell the kits. 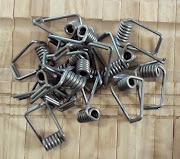 So, for figuring purposes here, I’m going to say that, after rejecting the defective halves, 300 square feet of ash yielded material to make 9,000 finished clothespins, which I sell for $2 each (Click Here for details). I estimate that the material cost of each clothespin is around 60-cents. That’s the cost of wood, springs (at 31-cents each), and wood finish. I actually think it’s less than 60-cents, but I don’t want to underestimate. The labor to make these clothespins is enormous. I’ve lost track of the labor on every production run so far. Labor includes not only machining the wood, but inspecting, sorting, finishing, and assembling. At this point, I estimate that the total time to make a clothespin, from raw wood to assembled and ready to sell, is around 3 minutes (20 per hour). That is, mind you, 3 minutes with a production run of 300 square feet of lumber. So, if my production cost per clothespin is 60-cents, and I can make 20 in an hour, and sell them for $2 each, here’s the math: $1.40 x 20 = $28.00 per hour earned. Of course, there are also the added expenses of your tools, electricity, packaging, and so on. Take $3 per hour off for that (more than enough) and you end up making $25 an hour for your time. Remember, these numbers are ‘ballpark.’ But they are not unrealistic. Fact is, I think my time and costs are actually less than I’ve used here. 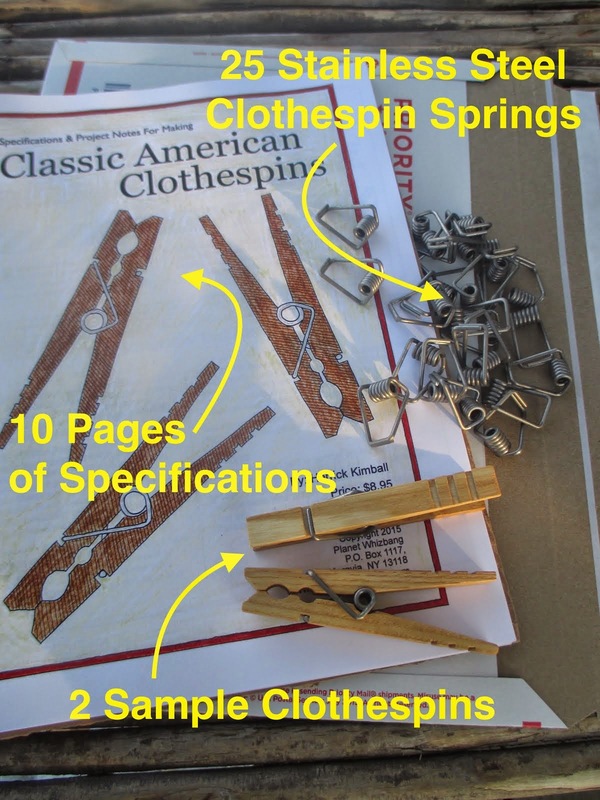 If you have an interest in making clothespins, get The Starter Kit. The kit gives you all the information that I wish I had when I wanted to make my own clothespins back in 2012. The kit is not expensive, and it will get you off to a successful start. Next, I suggest that you make a small batch of clothespins to give as gifts. Keep track of your own costs and the time it takes you. Then, come to your own conclusions about the viability and profitability of this money-making idea. In other words, dip your toe in the water before you jump in. One of the nice things about making and selling artisan clothespins is that the market for handcrafted clothespins is very big, while the number of artisan clothespin makers will probably never be very big. The reason there will probably not be a lot of artisan clothespin makers is that relatively few woodworkers have the patience and the focused determination to make and sell high-quality clothespins. It takes a lot of initiative and effort to develop your small-scale production system. Then there is the time and effort that needs to go into marketing. Quality clothespins practically sell themselves, but you still need to come up with an internet presence and get the word out. It also takes time for word-of-mouth from satisfied customers to shift into gear. 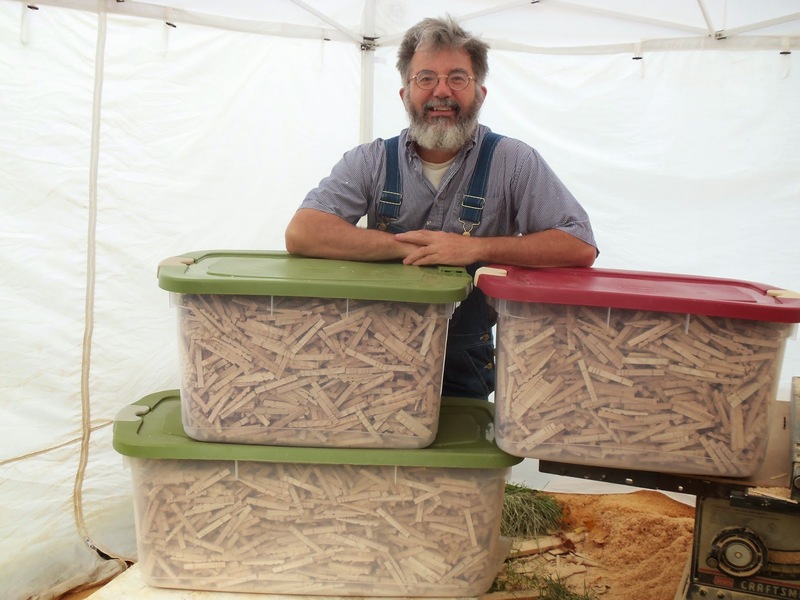 But, if you have the patience, the determination, and a long-term business perspective, you can become a true artisan clothespin-maker with a loyal following and a successful craft business.